Earlier this week, Pacific Gas & Electric pulled out of the US Chamber of Commerce. 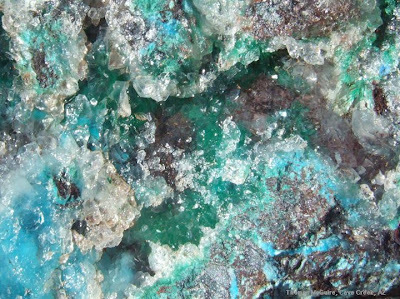 Now, the New Mexican utility PNM Resources has followed suit. At PNM Resources, we see climate change as the most pressing environmental and economic issue of our time. Given that view, and a natural limit on both company time and resources, we have decided that we can be most productive by working with organizations that share our view on the need for thoughtful, reasonable climate change legislation and want to push that agenda forward in Congress. As a result, we have decided to let our membership in the U.S. Chamber lapse when it expires at the end of this year. The world's largest economies will agree to phase out subsidies on oil and other carbon dioxide-spewing fossils fuels over the "medium term" in an effort to fight global warming, a G20 document said. The draft G20 statement showed countries such as Russia, India, and China will back a move to reduce and eliminate most financial support that keeps fuel prices artificially low, albeit without a timetable for the cuts. The Senate declined Thursday to take up Sen. Lisa Murkowski’s effort to limit for a year the Environmental Protection Agency's ability to regulate greenhouse gas emissions from power plants, factories and other stationary sources of pollution. Murkowski had sought to amend the Interior Department appropriations bill being considered Thursday by the U.S. Senate, but was blocked from bringing forward her proposal. California air regulators approved strict regulations Thursday for aerosol air fresheners, paint thinners and solvents as a way to lessen smog-forming emissions and reduce a health threat. The state Air Resources Board voted 8-0 to ban the sale of products that emit high levels of so-called volatile organic compounds. The rules are the toughest state mandate in the nation and will take effect Dec. 31, 2013. A federal district court ruling in Montana today returned Endangered Species Act protections to the Yellowstone grizzly bear population. In the case, brought by the Greater Yellowstone Coalition, Judge Donald Molloy ruled that inadequate regulatory mechanisms were put in place to manage the bears after federal protections were dropped in early 2007, and that U.S. Fish and Wildlife Service (FWS) failed to address the loss of an essential food source for the bears, whitebark pine seeds. The proposed project site was located in a remote wildland area currently being planned for inclusion in a new national monument proposed by California senator Dianne Feinstein. The new monument would connect Joshua Tree National Park with the Mojave National Preserve and would protect some of the most pristine, ecologically important and beautiful desert lands in the world. There are 200 Tonkin snub-nosed monkeys left in the world. 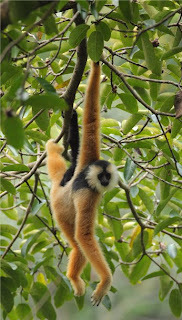 The cao vit gibbon, however, is even worse off with only 110 individuals remaining, giving it the dubious honor of being the second most endangered primate in the world (the closely-related Hainan gibbon with only 17 individuals is likely number one). Both of these species — the cao vit gibbon and Tonkin snub nosed monkey — have received good news recently as new reserves in China and Vietnam have been created in part to aid their survival. Photo by Zhao Chao, FFI. In a decline on par with that suffered by the American bison in the Nineteenth Century, in the 1990s the saiga antelope of the Central Asian steppe plummeted from over one million individuals to 50,000, dropping a staggering 95 percent in a decade and a half. Since then new legislation and conservation measure have helped the species stabilize in some areas but in others the decline continues. BBC news reports that Johnson Toribiong, President of Palau, has announced that a sanctuary about 230,000 square miles in total will be established to protect sharks. All commercial shark hunting in their entire Exclusive Economic Zone - about the size of France - will be banned. The combo cut the risk of becoming infected with HIV by more than 31 percent in the study of more than 16,000 volunteers in Thailand, researchers announced Thursday in Bangkok. That benefit is modest, yet "it's the first evidence that we could have a safe and effective preventive vaccine," said Col. Jerome Kim, an Army doctor who helped lead the study. A judge ordered the government Thursday to release more records about the lobbying campaign to provide immunity to the telecommunications giants that participated in the NSA's warrantless surveillance program. U.S. District Judge Jeffrey S. White ordered the records be provided to the Electronic Frontier Foundation (EFF) by October 9, 2009. [R]esearchers have attempted to quantify the benefits of covering urban rooftops with plants. The scientists found that replacing traditional roofing materials with ‘green’ in an urban area the size of Detroit with a population of about one-million, would be equivalent to eliminating a year's worth of carbon dioxide emitted by 10,000 mid-sized SUVs and trucks. Requirements include making provisions for mass transit access; building a connected system of external sidewalks and internal walkways; and employing a more environmentally friendly system of stormwater management that allows at least 25 percent of all water to return directly to the soil. Even its proponents were surprised by its success and its transformative effect on downtown businesses, particularly during a recession. Valley Metro light rail opened last December. Opponents viewed the $1.4 billion, 20-mile line a boondoggle for the largely auto-dependent city. Now some of them admit to riding it. Currently, an estimated 4 percent of the money Illinois residents spend on food each year is for products grown in the state, and just several hundred of the state’s 76,000 farmers are producing for the local market, according to a task force report. The tariffs are precedent setting in North America not only for the number of different technologies listed, but also for the prices offered. Solar energy advocates will be particularly pleased. Ontario’s proposed tariffs, if implemented, will be the highest in North America. For rooftop solar they will be comparable to those offered in Germany and France. Gordon Brown will add momentum to moves towards nuclear disarmament tomorrow by announcing that he intends Britain to build only three, and not the planned four, replacement Trident nuclear submarines. The move, which could cut billions from the defence budget over the next decade, was welcomed by anti-nuclear campaigners today, who said it was a "step in the right direction" but did not go far enough. This is actually pretty significant. If America and Russia move toward 1500 warheads, that is getting close to where the other nuclear powers - Great Britain, France, China, Israel, India, and Pakistan need to be included in negotiations. So Britain is moving ahead of the curve. Onwards and upwards. Swedish Matchboxes and Edible Geography. Photos by Kobi Israel. The South Bronx in the 80s and 90s. International doorhangers. 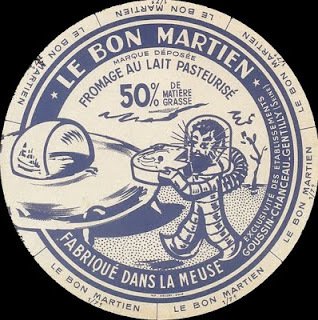 And vintage cheese labels. Lawnmower cards (via Plep). Photos by Henry Busse. Images from the Byron Collection. Drawings from the Civil War. 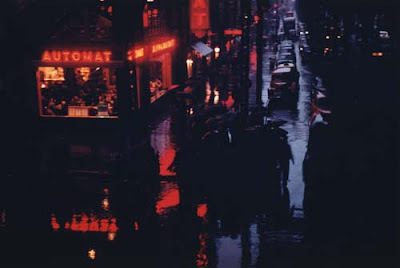 And photos by Esther Bubley. Animal Architecture and Abandoned Farm House Rooms. Urban Life Through Two Lenses. Port Townsend Then and Now. Lots and lots of red dust. 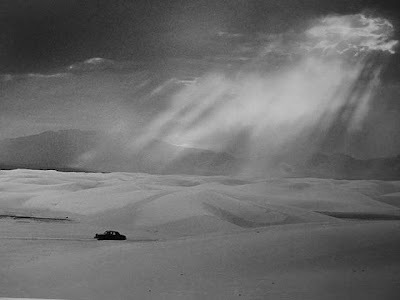 And via Moon River, a photo of White Sands, New Mexico from 1952. I like the light rail, but they made a mistake in not putting in crossing gates and letting it keep going. It takes over an hour to get end to end and another 40 minutes by bus to get out to the east valley. It's still "light" years ahead of the car or local bus to get to and from downtown! I like the light rail, but they made a mistake in not putting in crossing gates and letting it keep going. Interesting. At least it sounds like something they can fix, if enough people feel as you do? I almost thought the first item about the Chamber of Commerce was a parody, but then I realised there's no joking on Hope Blogging. That seems sort of significant. Also I sent a link to "Trade Tattoo" to a young film student who's looking for ideas. As always, a wonderful miscellany, Phila. "Trade Tatoo" is the coolest thing I've seen in weeks. Thank you again, Phila. I've started coming back through the week to read FHB to keep my spirits up. The Bubley photos are wonderful.